It's indeed super-exotic. Looks like the bug trio family in AQ40 yet it's tameable. The only issue is that it's "Rare" thus it could take a while to actually get it, especially of every Hunter camps for it. Let's hope the re-spawn timer is not ridiculous like 24 hours. The "Tameable" tag may or may not be removed before live, but we can all hope... a similar NPC is Harakiss the Untameable but it sounds like he really won't be tameable on live (unless it's supposed to be a trick name). Anyway, nothing is certain before the game is released. As a level 85 hunter, my experience on the beta test realm is that the respawn rate on this beauty is not quite long at all. It seems to be a steady 6-8 hour respawn rate as I was able to tame her and stayed in the general area (in an attempt to tame Harakiss) and about 6 hours after my taming her on 09/21/2010 @ 2:55 PM , she spawned in front of me again. To tame her I utilized my freezing trap, hit tame beast and approximately 10 seconds later, "Silly" was mine. Let it be known that the respawn rate on Ainamiss the Hive Queen seems to be a lot faster than Harakiss the Infestor is, at least in my experiences it has been. I will edit this post as soon as the live realms come online to see if either Ainamiss the Hive Queen or Harakiss the Infestor are tamable as of patch 4.0. The name of this brain bug is a reference to the wonderful hunter pet guru Mania of Mania's Arcania, top source for all hunter pet info. 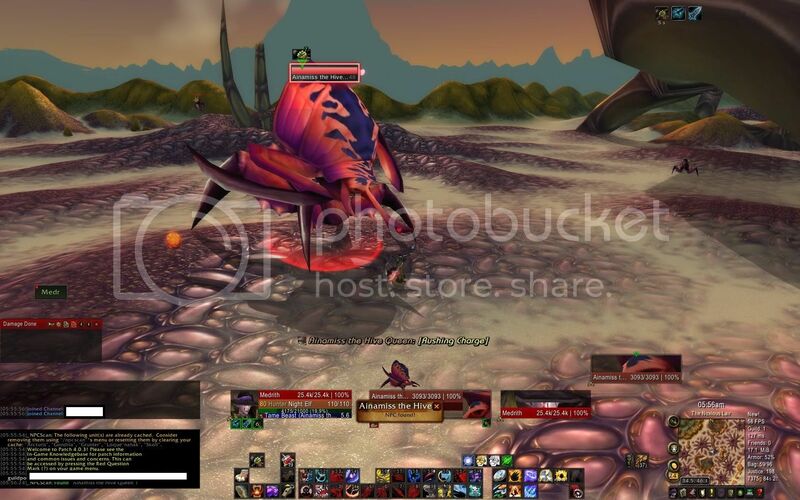 This is a tameable beast (exotic) and it is a rare spawn in Tanaris. It goes live in 4.03a, The Shattering. Good luck to all the hunters waiting to tame the Hive Queen! Just tamed her a few minutes ago (4.0.3a, live/retail servers), located in The Noxious Lair (approximately 34.5, 46.1). She is huge and is hard to miss. She makes a thudding noise occasionally while idle. And she is piiiiiink. Tamed her at location 32.96, 49.25, beautiful! I tamed Harakiss 2 minutes earlier and figured I'd come on over and have a look for her too. Does she spawn on the surface or underground? At the moment, after you tame her, she'll periodically make a 'slump' sound (like the sound of something falling over). Dismissing and calling the silithid back out doesn't stop the noise. Edit, still seems to be doing that along with her blue twin Harakiss. Tamed this beauty this morning on Stormrage server in the middle of place, where she spawns. Looks awesome. :) And it's a big and pink bug. :) Also the Qiraji fortitude increases your stamina by additional 585 points. Just a little clarification: you must have the Beast Master talent to be able to tame Ainamiss as she's an exotic beast. When you use Beast Lore and it reads Tameable (Exotic), the exotic part means it's only tameable if you've got the Beast Master talent. Ok, which of you clowns put a marker on the mountains, and another in the middle of the ocean! Make sure your pet is dismissed before going after this guy, the "You have an active pet" error doesn't show up if you're mounted. I just happened across this one - and when I tried to tame it, I received the message that it was not tameable. When killed, it dropped a Revenant Helmet of Defense. She absolutely is my favourite PVP pet. I love her. I tamed the one with half a brain a while ago and it didn't make a noise at all for its cry and what not so i got rid of it, does anyone know if this has been fixed or if the other ones.. with their brain intact make a cry of sorts? I have not been able to find her. I've killed big blue a bunch of times and every other rare in Tanaris. Of course this is the one I want to tame on my hunter and still no luck. Is she always on top of the hive or ever inside? She makes quite a loud noise when nearby, so you know when she's alive or dead. Finally got my hunter to lvl 69 just so i could tame this cutie so worth it! You need to be BM spec. All of Mania's hard work can now be found at Petopia. Sadly she no longer maintains the site, but it's still keep up to date!